3.7 out of 5 based on 29 bloggers and 3 commenters. 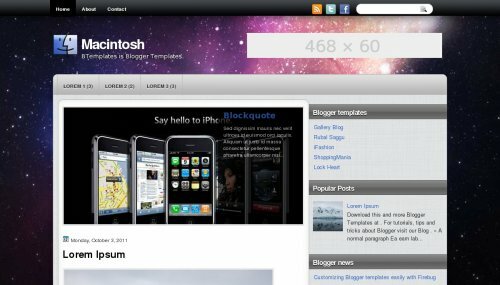 Macintosh is a free blogger template with 2 columns, right sidebar, rounded corners, an exclusive design for Blogger and social bookmarking icons. Excellent template for blogs about computers. anyone know how to make the slider without the layer and text just the images moving; s3slider no layer. How do I view the slide show? How do I upload this theme to Blogger?